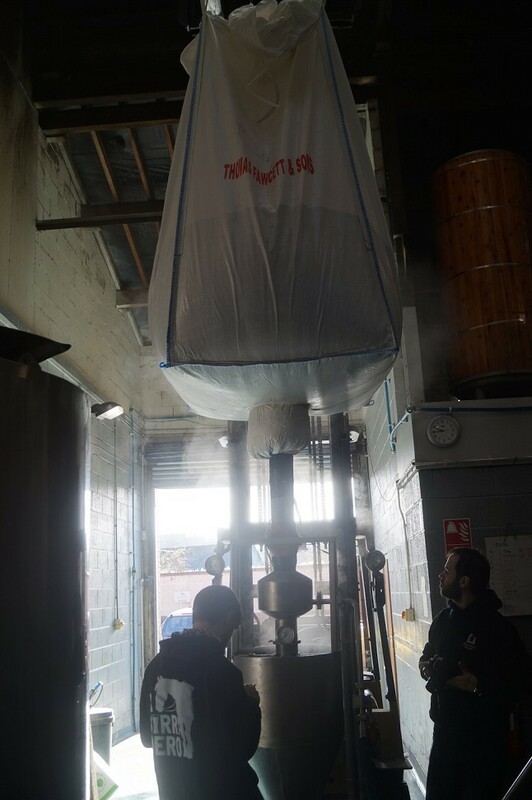 It's an exciting week at Abbeydale Brewery as we are hosting our friends Daniel Fermun and Iñigo Echeverria from Instituto de la Cerveza Artesana (I. C. A) and renowned craft beer bar Abirradero in Barcelona for a very special collaboration brew. Today we are brewing something a little bit different to our usual beers… An unhopped fruited gruit that will be packaged with B' Lambicus for an ever-developing flavour. “Gruit”, or “Grut”, means herb – a popular addition to beers many moons ago. A brewers' blend of herbs and spices often remained a very closely guarded secret, much like some breweries treat their hop additions today! After the passage of the Reinheitsgebot in 1516, the gruit ale gradually faded away into obscurity. Our recipe is loosely based around I.C.A. 's incredible Neolithic style fruited gruit, Encantada. It is based on a recipe akin to one found in caves with remnants of early settlements not far from the Catalonian capital. Archaeologists found residual evidence of the oldest remains of brewing beer in Europe, a wheat and honey beer that was flavoured with thyme. For today's collaboration, we have deci ded to produce a beer a little more in tune with British tastes, based on a traditional ale, with mugwort, yarrow, juniper berries and heather flowers. We are also using a small portion of lightly smoked malt to emulate the flavours of more ancient malt drying techniques. The beer, coming in at a target 7.4% ABV, will be fermented with a mix of our own house yeast and a Belgian strain of Abbaye yeast for its ability to ferment higher gravity worts and alcohol. Towards the end of fermentation we will be splitting part of the wort off into wooden barrels with our house mélange of wild yeasts and bacteria and leaving it to age for a year or so – we aim to release it for International Gruit Day (yes, that is a real thing!) on February 1st next year. In the meantime, the remainder of the wort will be fruited liberally with raspberries before being transferred with locally sourced honey and a secondary pitching of Brett Lambicus before being allowed to secondary condition in kegs, both for the purposes of ageing for the Brett character to shine or to be drunk fresh for a fruit forward beer.